Dinosaur Comics - February 2nd, 2010 - awesome fun times! –And roaches. Look, dude, you're just covered in bugs 24/7! February 2nd, 2010: Yesterday was the seven year anniversary of Dinosaur Comics! I started the comic on February 1st, 2003. Holy crap! Like in most years, I only noticed the anniversary when someone let me know, which makes me probably the worst parent -- but it's okay because my "child" is not "actually" "alive". OR IS IT?? No it's not, but thank you everyone reading these words! You've let me have the best job in the world, and I really really appreciate it. Thanks so much! Okay so TODAY'S comic was inspired by a Reddit thread, What's the craziest fact you know that most people don't know? It was one of those links that you click thinking, yes, YES, I am probably going to learn something awesome today. And I did, thanks to meloveyoulongtime! Poops on the MOON. 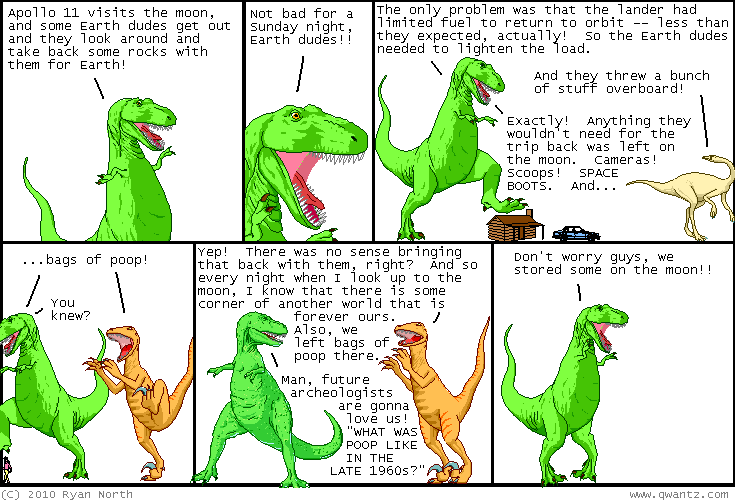 There have been a lot of moon comics AND poop comics lately, I am happy with the two recent obsessions of T-Rex being the moon and also poops, I feel that this is the best we could have hoped for. One year ago today: to my knowledge there are no helicopter pilots who have married poorly who read my comic. if you are one, then hopefully by "married poorly" you just mean "the wedding itself was ridiculous, strictly amateur hour"